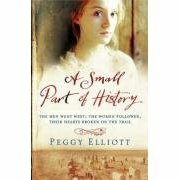 A Small Part of History by Peggy Elliott – It's Time to Read! In the summer of 1845 Rebecca Springer and her family join the Oregon wagon train in search of land thousands of miles away. It’s a hard and dangerous journey through blizzards and searing heat, over prairies, desert plains and mountains and, at times, it seems as if it will never end. But an unbreakable bond develops amongst the travelling women as they are tested, physically and emotionally, and their shared experiences of new life and tragic death will bring them closer than blood ever could. How the west was won and the terrible price that was paid. A Small Part of History is an epic, heartfelt story of courage in the face of appalling adversity, and a haunting portrayal of how America was forged. Above all, it is a story of people and how the ties that bind us most strongly are those of friendship, of family and of love. The Springer’s are joining a train to Oregon. They are hoping a trip West will change their fortune. Yet it will not be an easy trip. When they leave tensions are high between the family. Rebecca, the step-mother is at her wit’s end with Sarah, her 15 year old step-daughter, and Matthew is newly married, and his wife does not want to travel. Early on the family splits with Matthew going home. But this is not the first split the family will suffer. As they travel friends and family suffer from the heat, the cold, lack of food, pregnancy and many other trials. They won’t all make it to Oregon City, but those on the journey form unbreakable bonds and learn how to survive and love each other. I enjoyed this book. I have seen reviews where people have been unhappy that Elliott mixes up fact and fiction, but I read this as purely a fiction book, and found it highly readable. I loved the characters and how they recorded diary entries so we got to know them better. I enjoyed reading about how friendships were formed, and what it took to make those bonds. This book was full of adventure. There were fights with Indians, death, a desert to cross, family feuds – all sorts. At all points of the story there was something going on; this was a not a boring book. This was a good historical novel. It may not have been specific and the facts correct, but for a generalised idea of what this era was like for the women crossing America this is a good book. This is a gripping book, well worth reading. In fact, I have already lent out my copy I enjoyed it that much.